A. A cosmetic counter in a mall department store. A. It is not specified, but most likely in or near Tampa, Florida. A. 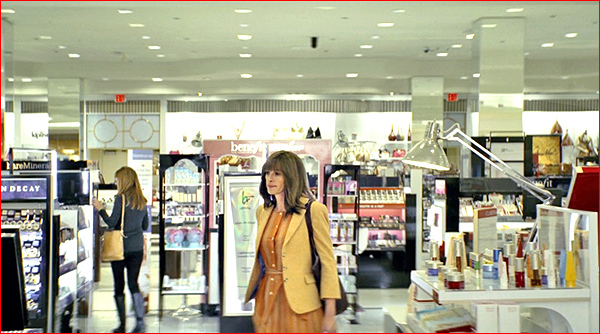 At the start of Episode 5 ("Helping"), at 00:46, we see Heidi ( Julia Roberts ) walking through the cosmetic counters, when she spots something. She nervously approaches a pretty salesgirl, who successfully tries to interest her in a product. Heidi asks "What is a plumper? ", and the sales girl explains. The salesgirl asks Heidi what is her "daily beauty regimen", and when Heidi hesitates ( because she obviously doesn't have one ) the salesgirl smiles, knowing she can probably sell her a bundle of products. A. Truth in advertising, folks! 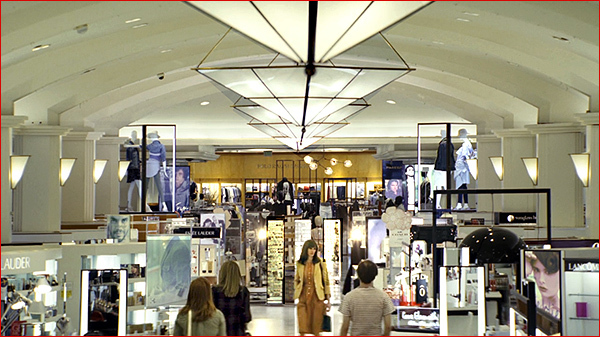 This is not a studio set, it was actually shot on location in the Macy's department store at the Sherman Oaks mall ( "Westfield Fashion Square" ), at 14000 Riverside Drive, in Sherman Oaks, CA. It's a nice, upscale mall, in the San Fernando Valley, right next to (north of) the Ventura Freeway. It's about 4 miles west of another "Homecoming" location, the Shanzhai restaurant, about 6 miles southeast of her mother's house, and only one mile southwest of the campus. A. A little history about this website: it's the end result of what started out as an effort to write the most world's comprehensive guidebook to Los Angeles, and I spent about a decade researching virtually every interesting spot in Los Angeles for that book. 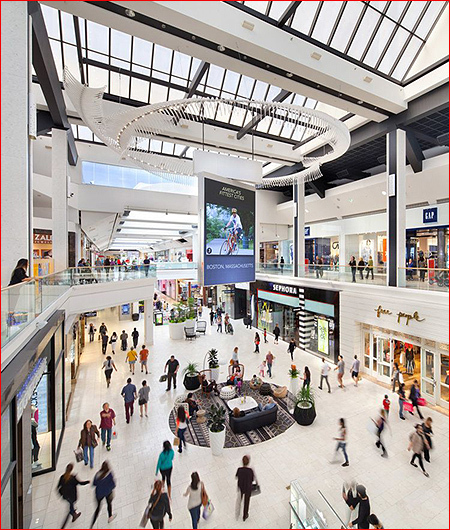 As a result, I visited ( among a zillion other things ) every major shopping mall in the Greater Los Angeles/Orange County area ( and there were a lot more of them back when I was doing that initial research, before Amazon started putting malls out of business. ) And this mall was on my list. Back then it was called Sherman Oaks Fashion Square, and it has changed over the years. 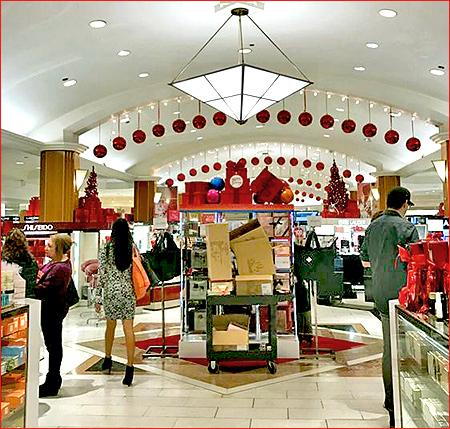 Those big, diamond-shaped ceiling lamps in Macy's are memorable. 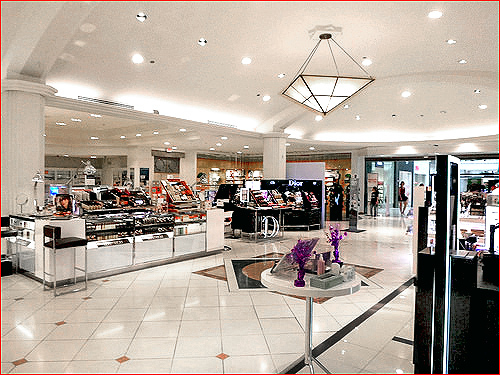 So all I did was Google for images of that mall, and matched them to the screenshot of the cosmetics counter, and that was all it took.